TRENCHLESS SEWER LINES - Benton's Plumbing Company, Inc. Conventional Sewer Line repairs are usually performed using “trench” system or the “open cut” to access the region enclosing the damaged part of the sewer pipes. Benton’s Plumbing’s Trenchless Repair System causes significantly less damage and impact than conventional repair techniques. We make small access holes at the beginning and end of the damaged line. Then our specialized hydraulic machine pulls complete-sized replacement pipe through the old line while breaking up the damaged pipe at the same time. The new sewer line is very resistant to root invasion and clogs and has a long life expectancy. 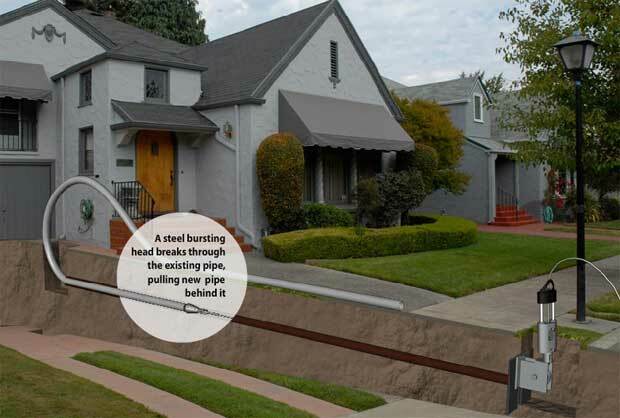 Relining is the process by creating a “pipe in a pipe” to restore the flow and function of damaged sewer pipes. Epoxy relining materials form to the interior of the existing line to generate a smooth interior wall like the liners you see in food cans. The relined sewer line is permanent and seamless, and all substances used in the relining process are safe.